You guys, I don’t even know where to start, other than, I MADE A VEGGIE BURGER THAT’S GRILLABLE. All hail the veggie burger! If you’ve followed Minimalist Baker for a while, you know I’ve made many veggie burgers in the past – exhibit A, B, C, D, and E. Yes, it’s an obsession – I know. 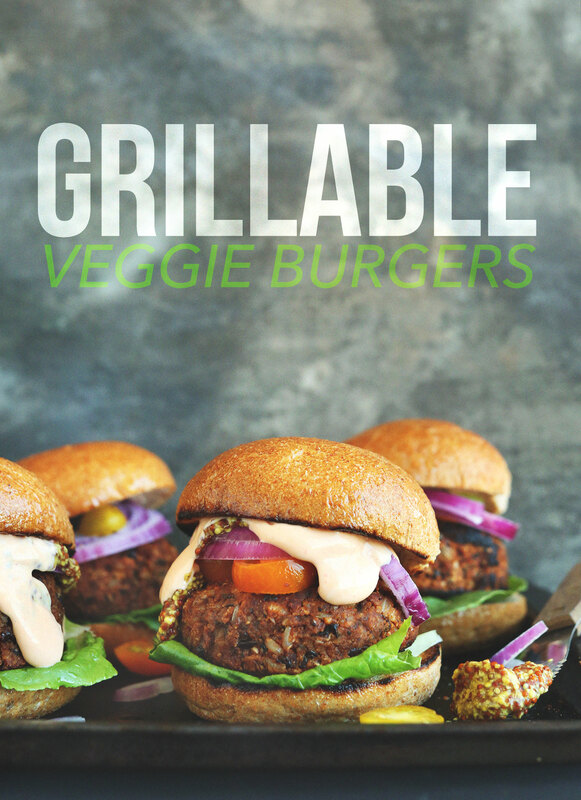 But none of these burgers have been truly “grillable” due to their fragile texture. And because we aren’t currently grill owners, I usually opt for baking or sautéing anyway. Recently, however we’ve been attending more summer BBQs and I’ve been receiving emails from people asking for a burger that will hold up on the grill. Friends, I’ve found the solution. Bonus? It’s so easy. This burger requires just 10 ingredients (give or take a spice) and comes together in 30 minutes (once your brown rice is cooked). All that’s left to do is form them into patties and fire up the grill (or skillet). I tested these burgers on both the grill and skillet and am happy to report they’re fabulous either way. You do get a bit more “char” and blackening on the grill, whereas with sautéing you get a more evenly browned surface. So pick and choose by which texture you prefer. Oh, and did I mention each burger (one of five) has nearly 14 grams of protein?! Trust me, you’re going to go home satisfied after eating one of these (especially when paired with a hearty salad, sweet potato wedges, or crispy baked matchstick fries). If you try this recipe let us know what you think! Leave a comment and rate it – it’s so helpful for us and other readers. And don’t forget to snap a picture and tag it #minimalistbaker on Instagram so we can see! I’d love to see what you come up with. Cheers, friends! In the meantime, heat the same skillet over medium heat. Once hot, add oil and onion. Season with a bit of salt and pepper and sauté for 3-4 minutes, or until onion is fragrant, soft, and translucent. Remove from heat and set aside. 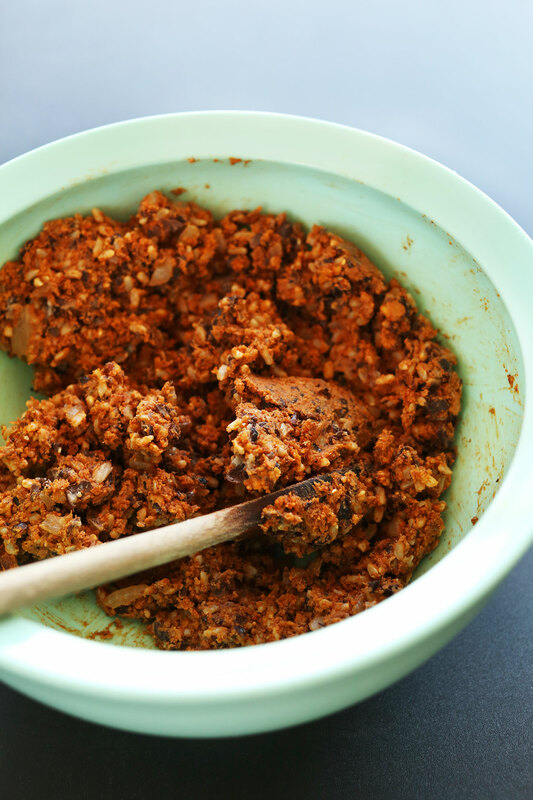 Next add cooked rice, spice-walnut mixture, sautéed onion, panko bread crumbs, BBQ sauce, and mix thoroughly with a wooden spoon for 1-2 minutes, or until a moldable dough forms. If dry, add extra 1-2 Tbsp (amount as original recipe is written // adjust if altering batch size) BBQ sauce. If too wet, add more panko bread crumbs. Taste and adjust seasonings as needed. For larger burgers, divide into 5 patties (1/2 cup in size // amount as original recipe is written), or form 10 smaller burgers (1/4 cup in size // amount as original recipe is written). To help form the patties, line your 1/2 or 1/4 measuring cup with plastic wrap and pack with burger mixture. Press down to pack firmly, then lift out by the plastic wrap’s edge, and slightly flatten with hands to form a 3/4-inch thick patty. Set on a baking sheet or plate for grilling. *One 15-ounce (425 g) can of black beans yields only 1 1/4 cups black beans. So if using canned, be sure to grab two cans (amount as original recipe is written // adjust if altering batch size)! Also, if black beans are unsalted, add 1/4 tsp extra salt to burger mixture (amount as original recipe is written // adjust if altering batch size). 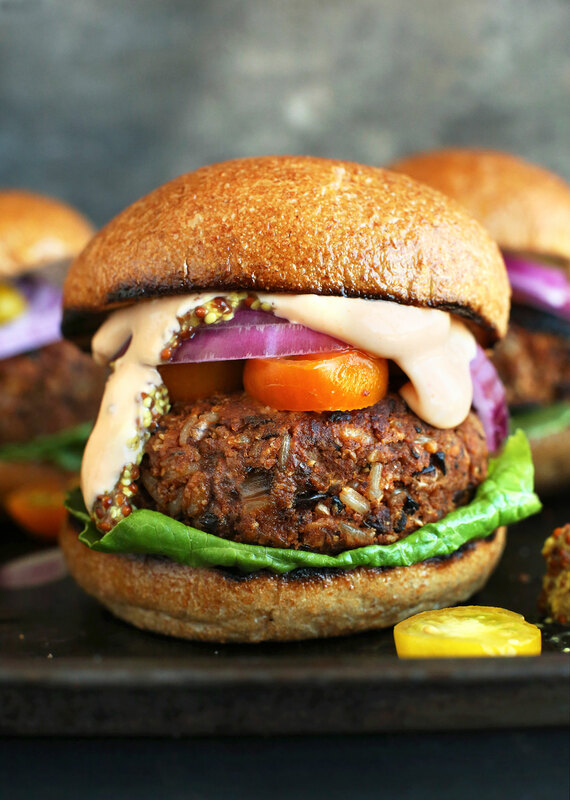 Hands down the best veggie burger recipe! I made them for my baby shower and everyone raved about them. They do stay together to be grilled and have amazing flavor. 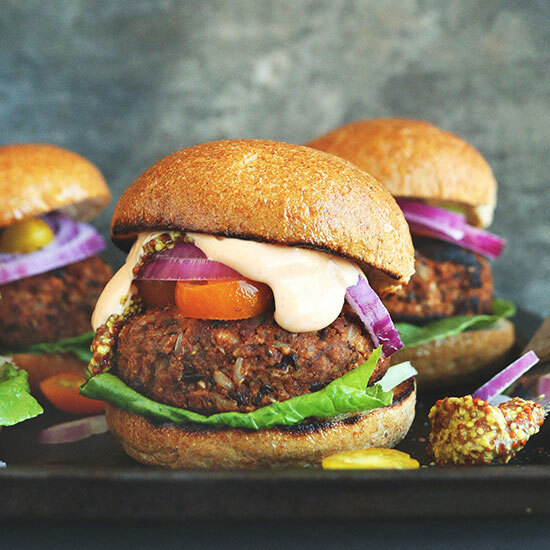 The best veggie burgers we’ve ever tasted!! Thank you very much for such a great recipe!! By far the best veggie burger recipe I’ve found! It’s wonderful that it holds together as well as tastes really good. Can’t thank you enough :). I’m shedding tears of JOY right now !! I just made these wonderful burgers. My husband and I are (Whole Food Plant Based) vegans, and finding a recipe for a burger that doesn’t fall apart….and tastes good….has been my mission in life for this past year. This is perfect !!! I didn’t have walnuts or panko breadcrumbs on hand, so I made bread crumbs with some gluten free bread. I also used sprouted brown rice and black beans that had already been soaked and cooked. I’m just so excited !!!! Thank you for posting all of your incredible recipes. Oh…I added extra spice, cayenne and garlic to the onions. This will be my veggie burger recipe from now on. Now I know what I can do with those darn left over beans and rice ! So glad to hear you enjoyed this recipe, Laura! Thanks for the lovely review! OMG. So so so good!! Delicious! I swapped raw sunflower seeds for the walnuts because I’m nut free. I was looking for a healthy swap for the store bought black bean burgers and this is it! Smokey and spicy and holds up well. Thank you for your creations! I just made this for a client. Literally just did a taste test. Great recipe. Thank you for it. I don’t like a thick burger so I’ve made smash burgers with these. Because I make them thinner I’ve been hesitant to try directly on the grill, so I do an oil coating in my cast iron and essentially fry them (makes for a great crusty exterior). I have also made up a big batch, just keep in large meatball size for refrigerator or freezer and smash as needed. I also break them up, fry up in oiled cast iron, and use as taco filling. Amazing burgers! Our first time making our own burgers and it was life changing! Never will we buy the frozen over priced things from the store again! Hubby raved about them! The flavor is good, BUT this is a lot of steps for a burger. Cooking the rice alone is half hour! The end result to me just wasn’t worth all the work. They make ready to heat brown rice in the freezer section at some stores. They are very inexpensive. I pick mine up at our local Walmart for $1! I literally have these burgers done in a 20 minute period. It couldn’t be easier. You could also make the rice ahead and freeze it yourself too. Saves tons of time! Hi! I’ve made this recipe two times now and the flavour is great. The only problem I have is both times the patties have crumbled apart in the pan. Any suggestions on how I can fix this? You could try and firm them up by baking them on a baking sheet for 15-25 minutes in a 350 degree oven! I’m not vegan or vegetarian but I have decided to go meat free for the month of February. Family were having a bbq so i decided to give these burgers a go. They are delish!! I didn’t have walnuts so I subbed it out with LSA and just my personal preference I would reduce the amount of chilli powder next time. Otherwise a tasty burger that holds together fantastically thank you! We’re so glad to hear that, Terri! This is the best veggie burger ever. The taste is fabulous and it’s pretty easy to make. I made a batch of dough for ad-hoc burgers since my daughter is home on winter break and loves these (she is the pickiest eater ever, by the way). I took some of the dough and crumbled it up, pan-fried for a minute or 2 and put it on nachos. Those were the best nachos I ever made. Honestly, I want to eat the dough before I even cook it-it smells so good. This recipe is perfect! These are so yummy. I actually didn’t end up grilling them but made them on the pan. But I’m sure they would hold up great. The flavor is amazing. My meat eater husband loves these. They are amazing. I have NOT made recipe, just surfing for nice burgers for vegans. One thing, I cook brown rice all the time in 30 minutes, but would not? include in recipe, since can be more dangerous, I suppose could make huge batches, them then throw in freezer. My recipe for brown rice, bring water to boil, dump in rice (and more, if wanted), simmer 15 minutes, cut off heat and leave cover on ‘pot’ the whole time. Bingo rice is ready. Hi, these are amazing and delicious but I’m curious why you say they only last three weeks in the freezer? I’d like to be able to make a huge batch of them to keep on hand without worrying them going bad. Lmk your thoughts please. Thanks! They may last longer depending on how you package them up! I’ve kept these in the freezer way longer than 3 weeks…just sayin. First of all, thank you for linking to Saveur’s recipe for brown rice. I’ve always wanted to try the boiling method to cook rice and it came out amazing! Not chewy or gummy at all. These burgers are divine! We topped our with more BBQ sauce, Follow Your Heart pepper jack cheese, and crispy onions. My non-vegan husband said they were some of the best veggie burgers he’s ever had! These burgers are delicious. I have made them several times. My family who are meat eaters love these as well. These burgers beat out EVERY other veggie or regular burger I have tried. Easy, peezy to put together and I was recently called out by my fiancé’s grandma for not being much of a cook. Hah! (For the record, my guy is aces in the kitchen and makes homemade bread, so why would I even…but I digress.) The texture and flavour of the grillable veggie burgers is decadent with just the right amount of spice. I even brought a batch of these homemade veggie burgers camping where my meat-loving Dad was both intrigued enough to try and impressed with how good they were. Seriously, do yourself a solid and walk on past those veggie burgers in the frozen section and make yourself a batch of these scrumptious black bean burgers. They are the BOMB! Yay! Thanks so much for sharing, Breanna! I apologize if someone has already asked this… What is your sauce on the burger? It looks like some type of aioli sauce. Can’t wait to try these!! Going to grill them up at my daughter’s birthday party! It’s vegan mayo + sriracha! This is SOOOO good! We’re making the transition to vegan, and my husband actually said he prefers THIS burger over a beef burger! I’ve already made it twice this week. Thanks so much!!! Yay! We are so glad to hear that, Lauren! I didn’t try them on the grill but they held together exceptionally well in a frying pan. Yay! Glad to hear it, Elisa! I have made these several times for vegetarian and meat eating friends and they are super delicious. This last time I didn’t have black beans so I used a combination of pinto beans ( from dried in my pressure cooker with a splash of liquid smoke) and fava beans from a can. It’s a super delicious substitution which I think I’ll do again as a variation. Thanks for the good recipe! Smart! Thank you for sharing your recipe changes, Lola! Eureka! A veggie burger that stays together!!! Followed the recipe (almost) exactly: used 1/2 BBQ & 1/2 vegan worchestershire. Topped with a pineapple radish pico and served on some toasted homemade bread. FANTASTIC recipe! Absolutely amazing- I am new to vegan cooking and this is one of my favorite recipes! My question is can these be frozen before cooking or do they have to be cooked first? Would these freeze well? I want to make these ahead of time for a camping trip and can’t decide if it would be better to freeze and thaw or just keep refrigerated? I Made these and they taste good but they did not hold together, I wonder if you have a special trick for keeping them together? Hi Margo! They are a little tender but should hold up. You could try and firm them up by baking them on a baking sheet for 15-25 minutes in a 350 degree oven! Delicious and very satisfying!! I used Panko crumbs instead of the walnuts. I added garlic and a little bit of Worcestershire for flavor, and an egg to ensure they held together. I put about 3/4 of the black beans in a blender and pulsed them a few times. Each patty was pressed firmly into a 1/2 cup measuring cup, and I came out with 6 patties. I also refrigerated them for about 3 hours prior to grilling which may have also helped prevent them from falling apart. We topped the burgers with sriracha mayo, avocado, tomato and cheddar cheese. Everyone loved them – including the meat eaters. Thank you minimalist baker!! ✌??? Yum! Thanks for sharing your recipe modifications with us, Stephanie! These are the best. THE BEST. They hold together like none I’ve made before, and so healthful and high-protein, with all those nuts and beans and brown rice. I’ve made them twice as written, doubled the recipe the second time b/c they went so quickly. I portion out the patties and wrap them individually, then store them in the freezer so they’re ready any time. They can go on the grill straight from the freezer. Thank you for sharing your substitutions with us, Dan! We are so glad you enjoyed it. These are wonderful…the flavors are amazing. I’ve made them twice now. Each time subbed quinoa for rice. 1st time I didn’t have panko so just used flour. Not sure what I did first time around but they were too wet for a grill (maybe I didn’t drain the beans adequately or could have been lack of panko). I baked them instead and they firmed up. 2nd time around I used the panko and they were much firmer. In any case, both times turned out great and this will be added to my regular recipe rotation. The bbq sauce I used made them even more special (and spicy)…it is a cherry ghost chili bbq sauce that comes from Cherry Republic up in Northern Michigan (where I grew up). Thank you SO MUCH for all your hard work and great recipes. I’m very newly vegan (a process that took about a year to happen) and you have made my life so much easier and interesting in the food department!! Finally gave this one a try since the recipe seemed pretty simple and not to time consuming. I did not have any brown rice so I used medium calrose rice instead. My mixture ended up being very dry, I thought the opposite would of happened because of the rice I used, so I ended up having to double the amount of bbq sauce. These burgers held together great! I ended up pan frying them since it was raining out, so can’t say how it would go on the bbq. The only reason I gave 4 starts was because I found the taste of the smoked paprika overpowering. It was all I could taste. I will either omit or reduce the amount next time. Hi I am always looking for new things yo serve my vegan son at family gatherings. I buy store bought veggie burgers but want to find homemade stuff as I prefer that. I went and got Walnuts and brown rice this morning to throw these together but realized I have two cans of garbanzo beans but no black beans. Has anyone subbed w garbanzo? Would it still be tasty and grillable? I did (I also subbed other spices for Indian ones, but I was going for a specific flavor) and they came out fine. The one thing I did differently when I made it with garbanzos was to puree half of them in the food processor along with some of the bbq sauce (liquid was needed to thin them enough to fully break down), since they’re a little firmer than black beans. Wow, flavor explosion! Just made this recipe and loved it. I used lentils instead of black beans, curry powder instead of chilli powder and ran out of pepper (what!?) so added chilli flakes instead. Will definitely go back to this recipe as a base for new flavor combinations. This was seriously very delicious!! My husband loved it too! It didn’t stay perfectly together (I think I should of added a bit more BBQ sauce) but it did much better than any others I have tried. The flavors were perfect. Yummy! Wow, delicious and they really *do* hold together! I found using the measuring cup or whatever to mold the patties was important — otherwise it’s hard to get the shape uniform enough and will crumble at the edges. Also, I used buffalo sauce instead of BBQ sauce to spice it up — extra delicious. Whoop! Glad you enjoyed these, John! I’m really confused by the measurements and am bad at maths. I have 250g of brown rice so wanted to increase the portion size in relation to the beans. None of the cups/weights matches up with any searches I do on cups or grams. Can anyone help a girl who can’t do maths??? I figured out the maths but what do cooked black beans mean? Does it mean they are very soft to the touch or cooked as they are in the can? I lightly boiled the beans for a few minutes because I felt they were too hard and then dried them in the sun but they were still very firm. Mashing them now is quite a task. all the questions, what is the meaning of life? This is my favourite veggie burger recipe. The texture is perfect and the flavour is simply delicious. I had to substitute oats for the bread crumbs and the burgers turned out great. I pan fried these on the stove too. Thank you for another great recipe!!! We love these burgers! This is our go to recipe. I make a double or triple batch and freeze them for later. The flavor is perfect and holds up great on the bun even loaded with lettuce tomato and pickle. I actually prefer them to a regular hamburger. Thank you. We are so glad to hear that, Stephanie! I made this recipe. I think it is the best veggie burger Ive ever had. Held together fine and a great consistency for eating. I toasted my nuts “well done” to get that smokey flavor. I couldn’t resist adding some fresh basil leaves from the garden. I ate it with mustard and fat tomato slices , and spinach leaves. I can easily see how to play with the recipe after making a great base. I love burgers, but gave up eating meat and hate soggy, or over processed store bought brands. I made this last night as a test recipeon the family ahead of cooking it for a large school group. I used the oats, as we were working with kids, and omitted the chili. LOVE LOVE LOVE. Husband loved it, kids loved it. Our vegan friends are eating the leftovers as I write this, and there is a rave sesh going on. Yay! Glad to hear it, Beth! Hi, these are definitely among my favorite burgers to make! I’m going to grill this Wednesday, so I feel I should bake in the oven a little to help firm the patties. I’m also making the day prior. How do you feel about baking a little, storing in the fridge, then grilling the next day? Really delicious, recipe exactly as is. Pan fried. GREAT flavor, spice. My sister in law talks about you a lot. And it’s funny because I have been making these veggie burgers for over a year now and just realized they are your recipe! We are not vegans or vegetarians in our house but we love these burgers. I like to make guacamole and then I serve them with a big dollop of guacamole on top. I use more bbq sauce and less cumin and chilli pepper to go with our own taste preference. I never use walnuts but use lots of bread crumbs. I find that my burgers can be a bit delicate so I would likely lose half of my patties if I grilled them. I cook them on the stove and they turn out just great. I will even take the left overs and crumble it over a salad..! Love this veggie burger recipe. We are so glad you are loving this veggie burger recipe, Haley! These burgers were amazing! My fiancé and I switched to full vegetarian earlier this year and have been living off your recipes. Hi Amy! You may be interested in this burger recipe as it is made with a chickpea base! I have a few questions? Can quinoa be substituted for brown rice and can quick cooking oats be substituted for the panko? Can green puoy lentils be used in place of black beans? Hi Amrit! You can use quinoa and oats, but we haven’t tried using lentils in place of black beans, though I think that should work. If you give it a try, report back! Make sure to mash the mixture enough so that they stick together well. Good luck! Thanks. They turned out great. I stuck with the black beans and added quinoa instead of rice and oats instead of panko. I baked them instead of grilling them and added homemade mexican seasoning. I also omitted the onions. Woot woot! Glad to hear it, Amrit! Hi! Do you think this recipe could be used to make a loaf rather than patties? Thanks! Hi Heather! Yes, I think that could work! If you give it a try, report back! I’m not a huge fan of black beans, or really any beans (quite a struggle as a vegetarian! ), so when I make these, I use diced mushroom instead. I sauté the mushroom well before adding to the mix which helps to get some of the moisture out. These burgers are so delicious! I make them often. My carnivore husband loves them, too! Fantastic recipe! Burgers are flavorful and hold up nicely on the grill. I made slider size for my guests and they were all devoured. I have a couple of notes regarding the recipe that you may find helpful: 1) the 15 oz can of Organic S&W black beans is exactly 1.5 cups after being rinsed and dried – no need to open a second can. 2) Use a 1/4 cup ice cream scooper to form burgers, if you’re making the slider size, which I highly recommend because these burgers are really rich. Hi Ebony – Cooking the beans yourself is easy, but takes time. You need to start a day ahead. You cover the beans with water and soak overnight. The next day, discard the water and cover beans with fresh water. Bring to boil then simmer until beans are tender. There are a few ways to prepare your own beans, so check out methods on line. I would suggest Alton Brown or Food Network sites, they are very reliable. Good luck! Hi Ebony! This recipe may be helpful! Anyone know if quinoa can be subbed in for the rice? Was hoping to use that to pack a little more protein but wasn’t sure if the texture would be the same. This recipe should be adjusted. I made it the other day for a bunch of people and I made the mistake of not going with my instinct. One tablespoon of chili powder for one cup of rice and one cup of beans is extreme. The burgers were too hot!! Hi Sherri – You made a good point that the author should suggest adding the chili powder in stages and taste as you go. Everyone has a different heat tolerance. Also, if you find your soup, stew, burger mix etc. is too spicy, add a tablespoon or two of honey. Works every time. Hi Sherri + Kathy! Thank you for your suggestion. We’ll look into it! The chili powder was too much! I wish I had gone with my instinct and reduced the chili amount because it totally killed an absolutely amazing burger. I think the author should reduce the chili amount in the recipe, especially after so many people mention that it’s way too much. I should have know that one cup of rice and one cup of beans doesn’t need one tablespoon of chili powder. What a waste of beautiful burgers. I will make these again, but please correct the recipe, or put a warning that these will come out absolutely hot spicy. wow this is my go to veggie burger I have tried many of them and this one is by far the best for the grill. Thank you for all your fabulous recipes. These were amazing. Held together perfectly. I subbed ground oats for the panko to make it GF. I used the food processor to chop up the beans after I did the walnuts. Made it much easier and even quicker. Thank you for the great recipe! Can you make a bunch and freeze for later, or should they be cooked first and then frozen? Hi Laura! To freeze for later, cook burgers as instructed on grill or skillet. Then set on a baking sheet or plate and freeze. Once frozen completely, seal in a freezer-safe bag or container and store for up to 3 weeks. Reheat in a 375 degree F oven on a bare baking sheet for 20-30 minutes, or until warmed through and golden brown (or in the microwave for 1-2 minutes). I have made this recipe so many times because my family and I love it. Hands down the best veggie burger recipe I’ve ever made. Just wanted to say thanks! Do you think I could sub in pecans for the walnuts?! These were great! I made exactly as instructed. I got rave reviews and they held up very nicely. Great flavor too. I made these last night for my husband and me. Great taste, stayed together for easy flipping BUT still a mush burger! Put on a bun and squished right out. Just can’t get a veggie burger to have the consistency to hold up in a bun. Any suggestions? Hi Annie! You could try and firm them up by baking them on a baking sheet for 15-25 minutes in a 350 degree oven! Absolutely loved these! I would add a little cayenne pepper for some heat next time, but they were a big hit at a bbq I hosted! Absolutely delicious! Restaurant quality. We had a hearty meal, froze the rest, and reheated per your direction to another great meal. So happy to have found your recipes! I have made these several times now and each time someone always asks me for the recipe. I leave out the sugar as I find the bbq sauce has enough sugar in it. Freezes well too even before grilling. Thanks for a yummy and filling burger recipe. I never leave reviews but I’ve sung your praises so many times, I feel I should. These are awesome burgers! The best part is that they really stand up to being grilled which means I don’t have to cook them…my husband is the grill guy. So any part of cooking I can get out of, I do. So thank you for figuring out a veggie burger than can be grilled. Thanks for all you do for those of us that are culinary-challenged. I made this for my parents and brother and sisters (who are very skeptical about burgers that don’t contain meat) and they absolutely loved it! I doubled the recipe to make extra and everything came out perfect. Definitely the best veggie black bean burger I have made so far. Made these veggie burgers today and wow so good! I grilled 4 and fried 4. My husband and I each ate two from the grill and they were so delicious. I’m taking a couple leftover to my Mom this weekend to taste. We’re meat eaters, but my husband asked if we could try a few veggie recipes and voila this was a hit!! THANK YOU for this recipe;) it’s a keeper!! Yay! We’re so glad to hear this, Natalie! Can these be baked? If so how do you recommend doing so? Thanks! Yes! I’d bake them at 375 for 15–25 minutes. I just want to say, we recently moved to complete plant based lifestyle. These burgers were fabulous and hit the mark with both my husband and I. I did reduce the seasoning since 1 TBL of each seemed too much so I reduced it to 1 tsp each of the chili powder, paprika and cumin. I used an organic agave based BBQ Sauce and this worked perfectly. Thank you for such a wonderful recipe that you can actual grill and flip. I have tried many veggie hamburger recipes but was on the search for something non-mushy. While all the recipes I have tried taste good, they just don’t have the density of meat that I miss. My search brought up this recipe and although it doesn’t say it’s non-mushy it does claim to hold together when you follow the recipe. For flavor I would give it a 5/5. Really tasty combo of flavors. I didn’t have walnuts so I substituted with raw cashews and omitted the sugar. They held together reasonably well (I pan-fried two of them). I find that chilling them first helps with that and flip carefully. I think that too much moisture is the worst culprit when it comes to mushiness and falling apart so follow the steps to keep that down to a minimum. Since my quest for a firm burger failed on this try I decided to crumble the mixture into small pieces and pan fried the bits until they turned crunchy and rolled them up with the toppings in a tortillia like a burrito. Delicious! I also tried baking the crumbles for about 40 minutes at 350 deg. and they also came out nice without the oil. This recipe is awesome. You can substitute the spices for taco seasoning, brown it in a pan and make burritos or tacos. Substitute italian seasonings, add an egg if you eat eggs, and use it for meatballs. My first post didn’t let me rate it…. AMAzing!!!!! <3 Seriously the best veggie burger I’ve ever had—and I’ve spent my whole life eating veggie burgers! 5 stars, hands down. I have one question. Can these be baked? If so what temperature and time do you recommend? Thank you! 10/10. I can’t score these high enough. The perfect vege burger. Thank you. Just made these, with a few substitutions, I had no black beans nor brown rice, used kidney beans and quinoa instead, work really well, super tasty, my omnivorous daughter loves them too! Thanks for sharing your recipe changes, Nicole! Anyone try substituting quinoa or barley for the brown rice? Ive made these multiple times with brown rice and this time I’m out so wanted to try an alternative rather than run to the store. Thoughts? It seems as though others have tried quinoa and had success with it! Add a small beet in there and they look like real burgers (if you them to). I have tried a lot of different soy burgers between Emeril L., Bobby Flay etc. This veggie burger is incredible. It stays together really well and the punch of flavor is there as well. This burger moves up to #1 on my list. For the BBQ sauce, we used Kentucky Bourbon flavor, but the low sodium one from Whole Foods is just as good. I tried half the batch with Kentucky Bourbon and the other half with the Whole Foods. I also added Muenster and Pepper Jack Cheese slices. Oh Yeah- This recipe rocks, especially with sweet treats potato homemade fries. Thanks so much Miminalist Baker. This was worth the work. *****. Five Stars Lady. I omitted the sugar from this recipe — I felt my BBQ sauce added enough sweetness. Otherwise, I made according to instructions. I used about 3/4 tsp. salt. The flavors were delicious, especially the paprika, which provided a nice smoky flavor. I measured by 1/3 cup, which provided 10 English muffin size patties. The burgers held up well on my indoor grill; however, they became pretty flat and mushy as we ate them. All-in-all we enjoyed them. My husband commented, “Not bad for a veggie burger.” I would make them again. I’ve noticed some people have issues with binding, I found that adding peanut butter solves this issue. I unintentionally added too much rice and my mixture was too dry. I added more beans, more bbq sauce and it was still very crumbly not strong enough to form a patti without falling apart, so I added about 1 tbsp of peanut butter and it was perfect. I’m guessing any nut butter would do. I have made this many times! The only thing I do differently is, I Don’t let the walnuts cool! The warm walnut oil acts as a binder. This gives much needed moisture and really holds the burger together! I have found that by cooking this in a non-stick skillet, it gets crispy. (I usually use cast iron). We make these burgers all the time! Absolutely love the flavor, texture, and how easy these are to make! Yes, that should work! Other people commented saying they’ve had success with pinto beans. These turned out AMAZING! The flavor is great, perfect amount of spice. These stayed together very well while cooking. They even stayed together surprising well while eating which I never expect from a homemade veggie burger. I absolutely love this recipe. I had been looking for a good vegan burger recipe and I have definitely found it. Will definitely be making these again! In regards to the black beans, how should they be cooked? Hi Ali! Are you using dried black beans? If so, in a large pot, add 10 cups of water for each pound (2 cups) of dry beans. Heat to boiling; boil for 2–3 minutes. Remove from heat, cover and soak for at least 1 hour or up to 4 hours (Hot Soak). Hope this helps! I’m sorry, I meant the canned black beans. Do they need to be cooked further or just use them out of the can? Thanks for your reply!!! Just use them out of the can! Absolutely brilliant! I love this. I had a collaboration with a top class Chef and the results was fantastic. Hi I just made the “Freddy’s Style Thin and Crispy Veggie Burgers”. I got it form the 31 meals cookbook. I couldn’t find that recipe on the site so I’m posting here as this one is very similar. I had a moment of inspiration and added beet. It made the mixture very wet so I added panko which made the mixture firm. It held up great in the stove top grill! I used olive oil in the pan. It did not stick once nor did it break. I used a mold to get a perfect round shape. I’m happy I used beet. It gave the pattie a lovely red colour. Thank you again for another great recipe. These burgers are divine and flavoursome. They hold together just perfectly. They were served on another gem, vegan nuts&seeds bread from The Lazy Cat Kitchen. Together with avo, pickles, mustard, capsicum, tomato. Yum. Yum. Note: I couldn’t be bothered getting a new batch of walnuts so I substituted them with almond meal and regular breadcrumbs. No dramas whatsoever. Thank you for a lovely recipe, Dana. Also omitted sugar and used red instead of white onion. Seasoning was just spot on. Hi there…..new to veganism. Can I use whole meal bread for the breadcrumbs? Hi Sandra! That should work! I have made two versions of this recipe for veganuary this year and they were both utterly delightful. I did however make some changes, opting for roasted salted pistachios in their shells (because that’s what was in the pantry), using a difference spice mix (macadamia dukkah and store bought burger spice mix in my favourite version) and also adding a hefty tablespoon of chiptotle peppers in arbol sauce when whizzing up the blackbeans in my food processor. I also included a generous splash of liquid smoke. I have cooked many vego burgers over the years but these are hands down the best I have cooked both in terms of savoury meaty flavour and “burger” like appearance. The texture I achieved may perhaps be a wee bit fragile for a grill, but cooked in a skillet on the stove they browned perfectly, stayed together fine and most importantly smell AMAZING while cooking. Given how quick and easy these are to make, I am certain they will be a firm favourite for years to come. I made this today. They are definitely grill-able. The texture when making the recipe as described was perfect. The only thing I would adjust is the spices, a little less chili powder and maybe add some cayenne. I made them on the larger side using a half cup measure and got 5 full size burgers with a little extra for a slider. It’s frigid outside here today so cooked them in a cast iron skillet. It makes a great crust this way and didn’t fall apart when biting into them. I used a soft bun, I think a hearty bun would be too much and force the burger to squish. At best, a brioche bun. Just made these – great flavour and texture but they fell apart when I tried to pick them up with the spatula…. not sure if I did something wrong but followed it exactly… We didnt mind – still tasted great! This is the best burger we have ever eaten, ever. The texture, flavour, structure, grilled crunch, ease to make. I’ve shared the link to Facebook because literally everybody needs to eat this. We doubled the mixture (this made 12 decent sized patties) but subbed out half the walnuts for bread crumbs (so we used 120g walnuts and 120g extra bread crumbs). We used half the cumin because my husband doesn’t love it and we added a tablespoon of Keens Curry Powder. We used a thermomix and after sauteeing the onion we simply chucked everything in there and blitz it on turbo for a few seconds. If you’re reading this and wondering if you should make it – yes, drop everything, make it immediately!! Even the kids loved it! Minimalist Baker always on the money. Thank you thank you!! I tried this recipe, and cooked the burgers on a skillet with olive oil. However, it was very difficult and they all fell apart. So I remolded them once they cooled down, but they still broke up when eating. – Any advice for next time?? Hi DJ! They are a little tender but should hold up. You could try and firm them up by baking them on a baking sheet for 15-25 minutes in a 350 degree oven! This is the first recipe I tried from your blog, and its AMAZING. Thank you so much. These were fantastic! Subbed cashews for walnuts because that’s what I had in the kitchen. The tip about packing them in a little measuring cup is key I think to getting the patty packed well enough to stay together. Have you ever tried Bushwick Kitchen’s gochujang sriracha???! So amazing on these burgers…. This is a super tasty flavour combo. I really enjoyed these. I didn’t have black beans in so I used brown lentils. They were very crumbly but I wasn’t trying to grill them so it was ok. I made these for BBQ and they turned out great! These were absolutely delicious! I diced some grilled piquillo peppers, and added them to the mash (yum)! No need to buy frozen vegan burgers ever again! This is a amazing recipe, and I’ve used it probably 10 times so far, and each time has been fab. I’m not a fan of black beans so I’ve tried lots of substitutes – I’ve used pinto, garbanzo, butter beans so far and all have worked just great. I’ve also used a wild rice blend instead of just brown rice and the different types of rice create a really nice visual in the burger, which is great if you’re not using the black beans. I don’t think you need the coconut sugar if you like to add sauces to your burger as ketchup and mustard sweeten the burger anyway. The only other thing I’d pass along is that the chilli/paprika content is too spicy for most people that I’ve served this burger to, so now I just use 1 tsp paprika and 1/2 tsp of chilli powder. Thanks for all the wonderful creativity and inspiration in your recipes. These were tasty enough and held together nicely, however I only used 1 heaping teaspoon of the spices ( not 1 tablespoon as written) and the spices overwhelmed all other flavours. These tasted ok with some disappointment. I am a 25 year vegetarian and while I appreciated the recipe, would make adjustments. They did in fact fall apart somewhat on the grill- on foil. I actually would add much more seasonings as I expected them to have a brighter flavor. They needed citrus, garlic, fresh herbs, etc. – something more punchy. The BBQ sauce did nothing. They weren’t a stand out, at least the first time I made them, but provide a framework to build upon. A good one for beginners perhaps but definitely change it up! Use more flavor, and, don’t cook on the grill. Made burgers last night for my vegan son and his girlfriend. Must point out that he was a carnivore for over 25 years and became vegan a few years ago. They both said it was the best vegan burger they ate, including Europe. I used more smoked paprika, added some Mexican seasoning but omitted the cumin. I also used fresh chilies (ground with the walnuts) and walnut oil. Did not have panko so breadcrumbs went in. The burgers grilled perfectly and the even the none vegans who got a small taste were really surprised how good they were. I just started going meat free and am aiming for a full plant based diet. I made these today and they are so delicious. They are very soft, but that is expected. I made them exactly as the recipe calls for and loved them! DING DING DING … we have a winner! I’ve tried over a dozen vegan burger recipes and this one has by far the best “beefy” flavor and texture. I substituted the panko for chickpea flour for a gluten free option, and it holds together great. I topped it with a burger sauce (mix vegan mayo and ketchup) which complimented it nicely! This is also an excellent high-protein vegan patty to go with my weight training. Hands down BEST patty ever ? This recipe has been a gift! We grill. A LOT! Practically every night when it is nice out. I’m on my fifth or sixth batch of these and I usually double it and freeze to have on hand. Love them and they are always a hit when I share. I don’t love BBQ sauce so I leave that out, use a little veggie broth for moisture and added some dry mustard to the spice mix to balance the flavor with no BBQ. I also leave the sugar out because I lean savory and I’m trying to cut back on sugar. Thanks for a beautiful recipe that is easy to prepare and really is grillable. Made them tonight. They were easy to make & delish?? They cooked great on the grill!!? Tasted good, but falls apart. I could see this working as a pancake-like patty in a skillet, but falls apart on the grill. Still looking for a good recipe for a grillable veggie burger. After rinsing the beans, put them on a foil-lined cookie sheet and into a 350 degree oven for 10-15 minutes to dry them out. Then do everything else the same as listed. (You might need to mash the beans with your hands after they cool since they will be much firmer). If you do that they will easily be able to handle the grill without falling apart. Good luck! Dana I made these today for grilling this evening. Can I freeze the other patties before grilling or do you have to grill before freezing? Im the only one in my family eating these. Ill let you know how they turn out. Yum! Hi Vicki! To freeze for later, cook burgers as instructed on grill or skillet. Then set on a baking sheet or plate and freeze. Once frozen completely, seal in a freezer-safe bag or container and store for up to 3 weeks. Reheat in a 375 degree F oven on a bare baking sheet for 20-30 minutes, or until warmed through and golden brown (or in the microwave for 1-2 minutes). Hope this helped! You definitely don’t need to cook them before freezing. We just pop them straight from the freezer into a skillet and they taste amazing. Source: Have made this like 20 times. Thanks Adam! That’s what I did. I froze them right away and got one out of the freezer, grilled it and it was amazing! This is the only burger that is tasty and does not fall apart! Yum! Thanks Dana! I made these for a bbq and they were very well received. I made them the day before and chilled them until needed. They held together brilliantly, better than any other recipe I have tried. I will be making them again. I made eight burgers with this recipe, I grilled them all, ate two and I tossed the others in the freezer. After reheating they tasted even better! My husband and I have made these burgers about 50 times. They are the BEST. We absolutely love them. Thank you a million times over. This recipe was excellent! House full of meat eaters loved it. This is making my transition to the vegan world so much easier. Love the fact that there are no eggs in the recipe and it still formed perfect patties. Can’t wait to make these again. Best black bean burger I have EVER tasted! This is a winner, and this recipe will be used over and over again! These were delicious, the texture was great too. I did a couple things differently as I didn’t want to go to the store. I used fava beans instead of black beans, and ground oats instead of panko, I have bread crumbs but they are not vegan. Thanks for the amazing recipe! After watching What the Health ( which was very disturbing) now I’m trying to change my way of eating ,since Monday I have been meatless on lunch and dinner, and you Dana with your awesome blog has helped me a lot. I made this burgues last night and they came out so delicious?. I’m pretty sure “What the Health” led quite a few of us here! I’ve made these twice, both times on the grill and they stay together perfectly! They are deeelish ! I love every recipe I’ve made of yours, thank you !! Omg ! This was delicious ! I subed the brown rice with quinoa …..just because I already had cooked quinoa and I was hungry lol and I added about a tsp on garlic salt …….again I say OMG ! Soooooo good and savory . The best I’ve tried so far. You’re always right on the money ! Recipe amazing! I used it to springboard a slight variation. used Lundberg wild blend rice and grains, also reduced the spices to half or less. Added garlic powder. Also processed mushrooms like the onions and sautéed these too. Doubled recipe and used a can of black beans and a can of kidney beans with a little pinko crumbs and little rice flour on my hands when forming the patties. Then placed between layers of wax paper and placed in ziplock freezer bag. Froze. Used a George Foreman grill to make a great pattie. My 3 year old granddaughter loved them. One word: amazing!!!! Fab in a brioche bun with best foods mayo, tomato, cheese and rocket. Simple but so good! I would also like to add I followed the recipe except I didn’t have any cumin powder but used cumin seed but the processor surely finely chopped it anyways neither did I have coconut sugar so I used stevia. It was so good I could have even done without grilling it and made a quesadilla with it!!!!!! This was absolutely delicious and I’m not a vegetarian or anything but do eat a very wholesome diet though we had friends in town that are vegetarians and this was beyond PERFECT!! My little girls 4, 2, 1 were even loving it (including my pregnant self haha). I wish I could attach photos of how beautiful these came out! I made medium size patties and it came out to about 7. I must say I was licking my spatula haha. I also feel that people are not giving fair reviews when they omit your suggested ingredients and add their own and don’t give it a fair rating!!! Thank you for this awesome deliciousness!! Great recipe! It was a lot easier than I expected and they tasted great! I made them for Father’s day and will be making them again this Sunday for a game night with friends. I made this with a few minor changes. Instead of a full cup of walnuts, I added 3/4c walnuts plus 1/4 cup vital wheat gluten. I used instant forbidden rice. I added some aquafaba as it seemed a bit dry, possibly because the rice was quite firm and I didn’t want to add more BBQ sauce. I only put 1/2T each chili powder and cumin as I didn’t want it to taste too Tex Mex. I Had been sceptical, but it stayed together on the BBQ and tasted excellent. These were really good! I think mine were a little too wet but they still managed to hold mostly together on the BBQ. Most vegan burgers we eat tend to be really dry and these weren’t dry at all. Thank you for the recipe – it’s a keeper! These were so good!!! and i had all the ingredients on hand. I love this site? Made these tonight for tomorrow’s festivities (7/4) and they are really tasty! I didn’t have BBQ sauce handy so I subbed ketchup, and didn’t have bread crumbs so I threw some GFV bread slices in my food processor. (Bummed I missed the crushed pretzels suggestion by a responder. :) I enjoy reading others’ posts to see what they did to change it up. Many thanks for sharing your hard work and awesome recipes! I have just received your book and I have tried Smoky BBQ Veggie Burgers. But as usual, each time I tried to make these kind of patties, they fall apart when I flip them over. :( Would have any kind of advice for me? Thank so much in advance! Try adding aquafaba. It’s a miracle. Is it possible to leave out the onions? Would that effect how well the burgers stay together? Love these. I’m eating like a king at work. These were great! This was my first time making a vegan burger(I’ve made vegetarian ones in the past). I made them exactly as the recipe says and they held together beautifully. My husband and myself both loved them, we will definitely be adding these to the dinner rotation. Thank you for this recipe!!! To freeze for later, cook burgers as instructed on grill or skillet. Then set on a baking sheet or plate and freeze. Once frozen completely, seal in a freezer-safe bag or container and store for up to 3 weeks. Reheat in a 375 degree F oven on a bare baking sheet for 20-30 minutes, or until warmed through and golden brown (or in the microwave for 1-2 minutes). I made black bean burgers before but not as tasty as this recipe. My husband loves hamburgers so much that he would eat some every day, hence making veggie is a logical step to keep him healthy. These are seriously delicious!!! Thanks for making a believer out of me as I have eaten some awful veggie burgers in my time. Great recipe! What ingredients are key to making it grillable? Would quinoa be ok to sub for rice? Score again, Dana! I made these last night and my husband put them on the grill. PERFECTION! They didn’t break, stick, or crumble. It was truly amazing! And so fast to put together. I must add that besides being truly grillable, they tasted delicious too! I subbed pecans because I was out of walnuts and used a spicy BBQ sauce. It was a delicious addition to my veggie skewers! Hi Melissa! I think that trying to substitute for the beans and walnuts on this recipe would be quite tricky. That being said, why not try this recipe instead? I think you may have more luck with it if you can do chickpeas! Hope this helps! I made this- it held up on the grill and was delicious. Boyfriend said the best veggie burger he ever had. I added an egg because I wasn’t a little worried it wouldn’t hold together. THe walnuts are an MUST. These burgers are delicious! And compared to other veggie burgers I’ve made, are super easy and quick. I cooked them on our shared building BBQ so was slightly concerned about sticking and making mess, but there was no issue. I highly recommend these! Very, very good, very easy. Next time will omit bbq sauce and sugar and use a spicy ketchup as we like a kick. These are the best burgers. I first found your recipe in January last year and have been making them ever since. I use organic red Jasmin rice. I make a big batch each time as quarter pounders, freeze them and they cook perfectly from frozen on the hob in a little coconut oil and stay intact. I now can enjoy going to BBQ s when invited as I can safely take my own vegan burgers and some to share. Thank you MB. Not sure why only 4 * the first time I tried to click 5 but it wouldn’t light up! Any ideas on what to substitute the BBQ sauce with? Thank you!!! Hi Luisa! I’d just leave it out! These burgers are fabulous…great flavor! We just started a plant based diet and this burger definitely delivers on flavor and did not fall apart on us! The key is to mix it for 1-2 minutes as the recipes states. I used an English muffin mold to form my patties because the measuring cup did not work for me. I used 4 Tbls. of home made BBQ sauce (Easy! Google Bobby Flays Barbeque Sauce made with Chipotle Chili). We grilled our burgers on a charcoal grill and left them on too long but they still had moisture. I rubbed a little olive oil over the tops of the patties to make sure they did not stick. Our friends who are not plant based really enjoyed the flavor of these as well. Measurements are right on! I have made these burgers several times now. They are my favourite. They do stand up to grilling but you have to be careful when grilling them because they can fall apart. Yesterday, I added 1 tbsp of ground flax mixed with 3 tbsp of water. The flax kept the burger quite firm and you don’t have to cook them carefully. Flip till your heart’s content. 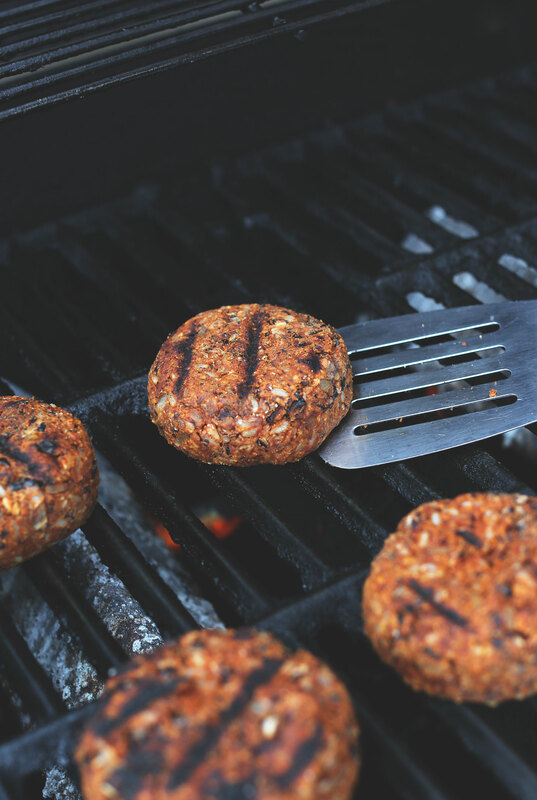 Flax may be good as a binding agent with some of your other burger recipes that can’t be grilled as they stand. Thank you for your efforts in helping me with dietary restrictions. Your recipes make me feel like I have no restrictions. I make these regularly — I love them, and so does my non-vegetarian husband — but I picked up a tip from another recipe that I’ve since incorporated, that I think makes a significant improvement in the texture: dry the beans out by baking for 30 minutes at 350 degrees, spread in a layer on a sheet. Then proceed as directed. This change makes the texture a little chewier and helps the patties hold together more. Terrific flavors. We adore these, and every time I make them I get a big thumbs-up. Made these tonight – I subbed in gf bread crumbs – delicious and I ommited the onions. Mashed some avacado with lemon on top. Used gf bun. Hands down this was the BEST veggie burger I have ever made! Once again Minimalist Baker rocks ! Thank you ? BBQd these tonight and we all LOVED them. I did reduce the smoked paprika by a lot just because I find it an overpowering spice but followed the recipe otherwise. Sooooo delicious! Actually I think I prefer these to beef! I made these a few times exactly as written and I absolutely loved them. They held up perfectly in the pan and were easy to (gently) flip. Since then, I’ve experimented with them a bit. I’ve finely chopped red pepper, carrot and even broccoli and sauteed it with the onion and added it to the mix. I also use whole wheat panko and have subbed quinoa and even couscous for the rice depending on what I have in the fridge. I’ve also added a scoop of flax seed to the walnut mixture to boost nutrition. This recipe is so delicious no matter what I do to it. Love, love, love it! Just made this for dinner tonight. I can’t say enough good things, jam packed with flavor, easy and they totally stick together. While they aren’t as firm as meat who cares lol! They are far better for you and are cruelty free! I am personally always creeped out by things that are too meaty anyway. Way to go Dana! Btw I substituted panko for oat flour and they worked great! I soaked 3/4 cup of black beans overnight and cooked them. I’m guessing they yielded much more than 1 1/2 cups cooked beans. What do you find the ratio of dry to cooked black beans to be? I made this exactly according to the recipe and they turned out so good!! The spices were perfect and the consistency of the burger was awesome – not too mushy and the outside was nice and crispy (I pan-fried ours). We paired our burgers with some homemade baked fries and a homebrew :) Delicious! I have made these veggie burgers 10 times at least and my family loves them! The flavor is better than any other veggie burger we have had. I even chop up mushrooms and other veggies left from the week and cook them along with the onions. All I can say is they are fantastic. Thanks for the great recipe. I used a four bean mix instead of black bean. Can’t wait to make the recipe again with the black bean! Could I sub black beans for lentils? I have a hard time digesting black beans. Also, I’ve seen others comment and say they had a hard time keeping the burger together while cooking it. Any tricks to keep that from happening? I think that would work! If you give it a try, let us know how it goes! Make sure to mash the mixture enough so that they stick together well! This looks delish! I plan to bring this on our long haul airplane trip next week. Flight is on the Tuesday/ Wednesday. Plan to make this on the Sunday prior. Any tips on how to keep it fresh? Hi Maple! Hmm I’d recommend definitely freezing them and transporting in freezer bags. If its a long flight, they’ll likely thaw but the best you can do is freeze them if you’re wanting to bring them along. Hope this helps! Flavor was really great but I found them a bit dry. I actually have made this recipe twice. First time as burgers. They fell apart. Needs to have something to bind them a bit more – like flax seed, chia or sweet potato. Maybe some vegan starch like arrowroot. Flavor is fantastic. I made them the second time as a filling for Stuffed Red Peppers. Put some Pineapple Habanero sauce over and was amazing. This is still my favorite recipe (minus any oil or sugars). Yum! My wife and I put them in air fryer (Thank you QVC) and they come out perfect, no oil and guilt free. I have to admit that they turned out so perfect we never have tried to grill them. For a quick lunch or dinner, they go great on Ezekiel bread or in a whole-grain wrap. Double the recipe and make a bunch for the freezer. Trust me, it’s worth the effort and you’ll spend less time in the kitchen and more time living. We love your recipes, Thank you! These were absolutely delicious! I can’t wait to make these again! **I increased the spices the first time around, but I’ll continue to do so. I also added some garlic powder & onion powder. I made this for dinner tonight and it came out great. I usually make veggie burger patty with beans and potatoes. I saw your recipe and decided to try it and I am really glad that I did. The walnut spice mix gave a very nice flavor to the patty. Love these! We have made several times as tasty burgers, but on the last batch my new chili powder was too spicy. I added in pinto beans and corn then stuffed the batter into enchiladas. Thank you! This quickly became my absolute favourite veggie burger recipe. I use red kidney beans tho because we don’t have canned black ones where I live. Tastes amazing! I want to buy them already made. I’m disabled. Is that something you might do anytime soon? Sorry Pam, that is not something we currently do! I recommend checking your local grocery store or market for some veggie burgers if you’re looking to purchase some pre-made. Hope this helps! The taste on these are great! My non vegan sister really liked them! I think I made them too thin or something but they did fall apart a bit. Also going to maybe add a bit more bred crumbs next time! I have bees. Do you think honey would work in place of the coconut sugar? Have been looking for a good recipe. Made them for dinner and even my husband enjoyed them. Too much snow outside so I fried them in pan on the stove. They did crumble more than I thought but maybe I’ll make them ticket next time. Still delicious flavor! Just made these and they are delicious!! Have tried the store made ones and was not that crazy about them. I am a new vegetarian so still trying recipes. Would definitely recommend this one! Just grilled these! Really good, best i’ve tasted! Ran out of walnuts and substituted it with a selection of pinenuts, cashew and peanuts, and a little walnuts. Taste was amazing. Thanks! I made this in a skillet and they weren’t very stable. Kept falling apart. What did i do wrong?? They were super delicious even though they were a bit crumbly! This looks AMAZING! Could you use olive oil instead of grape seed or avocado oil? That’s all I have at the moment. I’m adding this to my list of recipes we eat weekly which already includes your southwest tofu scramble! I did not care for this. It was quite sweet. Tasted like a baked bean patty. Some of the family liked it, surprisingly my 14-year old son who is picky. Might be OK as little “meatballs” on top of a salad, but I’ll keep looking. I don’t know if I messed it up somehow but it didn’t turn out very well for me. I also couldn’t find vegan panko bread crumbs so I made my own from toasted vegan bread. This is a family favourite, the kind that I will write down and put into my recipe box and my children’s children will savour for years and years. Thanks for these, definitely hold up well every single time I’ve made them, and that is a lot of times. Everyone who tries loves them. Brilliant! I’m trying with quinoa tonight to see if I can get some extra protein packed in! 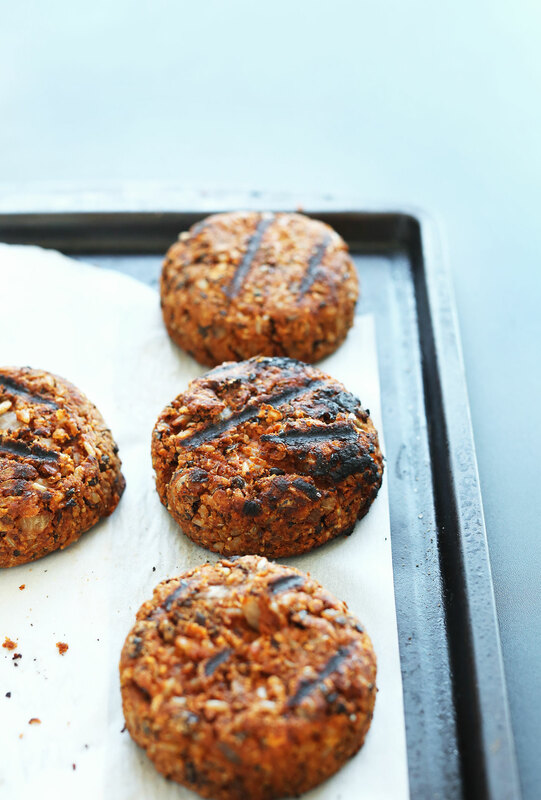 This one sounds really great but was wondering if you have a veggie burger that is made with seeds and oats. Had one at a place called OTC just outside of Thunder Day. Been looking ever since. Cheers..
Oh and we added some garlic ? Holy Guacamole! I made these last night and I was so pleasantly surprised at how flavorful these are. The coconut sugar really packs a good punch of sweetness, which really goes nicely with barbecue sauce. I never would have guessed that all of those spices (plus the walnuts) would go together, but it really works perfectly. I loved the grilled onion inside the patty and I also grilled extra onion for the topping. I would choose this over a meat patty any day! Thank you so much for sharing this recipe. Making these now and they’re coming out great, both for consistency and flavor. I reduced the sugar by half, but will just cut out completely the next time I make them. Didn’t have BBQ sauce, instead used some leftover marinara sauce and still really tasty. Other subs: gluten-free panko and cashews instead of walnuts. Plan to freeze half for dinner later this week. Thanks! For a guy who is not spending much time in the kitchen I had lots of extra cooked rice and beans as these “expanded” on me, and the receipe asks for these in volumes of cooked rice and beans. Measurements of dry beans and rice would have helped me. Tried food processor to mix everything. No good, ended up with fried “paste”. After new batch was hand mixed and adding an egg thinking that might be a good idea, they came out quite nice. Still need to work on technique and amt. of BBQ sauce etc. (to taste) but wife thought they were good, so I am on the right track. Have only fried them in a pan so far, but see they would do ok on the grill. I have never tried a veggie burger before, so this was a pleasant surprise! This was my first veggie burger recipe, so I can’t compare – but I can’t imagine anything better. Wow, it tastes great, and held up to grilling just fine. I modified some things. I live in pecan country – so, I used a cup of pecans, toasted medium golden brown (instead of the walnuts). (Instead of the white onion) I chopped a fairly good size sweet onion, and sliced an 8 oz box of button mushrooms, and reduced them all in a skillet with vegetable stock as needed – until the onion was more caramelized than the average bear usually does – final volume being somewhere between 3/4 to 1 cup. The grape seed oil, I just put in the bowl, to mix in with everything else. I elected the brown sugar (rather than the coconut sugar). Otherwise, I followed the recipe. Thank you, Dana – you’re doing something great for others! Made this tonight, it was just ok on a bun with toppings. Maybe it was wrong to be expecting more of a morning star burger taste, it just really didn’t meet expectations. The cooked patty tasted too nutty, and other than the BBQ sauce there wasn’t much savory element to the burger. I’m not vegan but just made these for vegan friends and oh my goodness they are AWESOME. Great flavour and texture and I hate beans but I love them in this! Got some vegan “cheese” to go on top too. I made it today. It came out very nice. Yummy. Thanks! Made these last night and they were perfect! It was surprising that I had all of the ingredients, but it did. They were really flavorful, and the texture was nice. I will mash the beans completely next time because I hate the feeling of biting into a whole bean. Hey thanks for the recipe, I was wondering if you can freeze the patties prior to cooking like you would to a meat patty. This looks like a great recipe, and I was wondering if you could freeze the patties before cooking. Throw some green banana fries in the mix and we’re in business. Excellent all around! Taste and texture were an A+. I cooked mine in a cast iron pan since we don’t have an opportunity to grill at the moment. I also added more panko bread cumbs as needed to help the mixture stick together. My husband loved this version of a veggie burger the best. Thank you! What is the sauce/topping on the Grilled Veggie Burger under the top of the bun and under the ketchup/mayo sauce? Anyone have the recipe for this sauce? This is also shown in the picture on the right side of the plate the veggie burger is served on. Hi there! It’s a mix of vegan mayo, ketchup and sriracha! + whole grain mustard. I am transitioning to vegetarian and these are better than regular beef burgers. They are much more flavorful and filling! I topped them with roasted red onion and orange peppers which a slice of cheese and put them on an onion bun. I will be recommending this to every chef I know!!!! Amazing!!! I am curious as to how far in advance that you can make burgers before actually cooking them? Do they get mushy in a short amount of time or do I have a few days before they can be cooked? Thanks! Hi Brian! I think you could make these up to a few days in advance They won’t get mushy. Good luck! Ok this was my first try with a homemade vegan burger. I made some changes like put some chickpeas in as part of. La k beans. It grilled great but wasn’t as solid as I like when eaten. The taste was a little sweet also. Next time I will cut the sugar. It was a success but is a work I. Progress. Thank you for sharing. Made these burgers with a few subs- sesame oil instead of grapeseed, pinto beans instead of black beans, and we added a 1/2 cup black olives and 1/2 cup red pepper sauteed with the onion. These burgers were delicious. We cooked them over the camp fire and they tasted superb. Texture was not 100 %, but the leftover burgers that sat for an extra 15 min were perfect. I made these burgers over the summer for a vegan BBQ that I hosted. Both the vegans and the carnivores loved them! I had to send the link to the recipe. And they grilled beautifully. Kudos on a great veggie burger! I have a very big man who is vegan, and burgers are always the things he missed most about the vegan diet. I’ve made these 4 times over the last year, and I have to tell you – this recipe is killer. Fantastic. Love your site – it’s the perfect balance. Thank you for your efforts and sharing! Made the recipe. Love it. Even though I had to make some minor adjustment because I live in Mexico. My question is can I make patties and freeze them? It’s just me and my husband and we happily ate burgers for the better part of the week but it would be great to be able to pull them out of the freezer once a week for the sake of variety. Or to have some on hand if something unexpected comes up. I made a double batch for a BBQ and froze the leftovers. They were just as good as the first time when I defrosted them to re-heat. I always try to review the recipes after I make them. I debated reviewing this one because I had to make a lot of substitutions due to the ingredients I had on hand. I wanted to make it exact, but I was impatient and wanted to make them right away! Substitutions: First, I substituted quinoa for the brown rice. Next, I used a little extra black beans (I used 1 can total; about 2 cups) and I also added 1/4 cup of regular breadcrumbs to compensate for not having walnuts. Then I used red onion instead of white onion. I made 8 patties instead of 5. Since I can’t compare the changes I made to the original recipe I can’t say if there was any difference in texture. I CAN tell you that they held up perfectly, and the texture was really nice. As for the flavor, they were amazing. I imagine what I made probably tasted a little different because I didn’t have walnuts. However, I used all of the spices that the recipe called for and it was a perfect combination of flavors. These are the best black bean burgers I’ve ever had. Since I used quinoa instead of brown rice, the recipe took 30 minutes total. The patties formed easily and didn’t fall apart while I was assembling them. They cooked evenly and held together perfectly. Make these burgers, and you’ll want to eat them every day! Oh and I used breadcrumbs instead of walnuts because I couldn’t find any at the time I bought the ingredients. Since I became vegetarian (now vegan) I never ate (nor cooked) any burgers because in my town there aren’t any restaurants that sell vegan ones (not even vegetarian) and I’ve been to lazy to make them myself. But now I decided that it’s time to cook for myself and came upon your blog and this recipe. The first time I made them I tried to fry them in a pan and they barely held together (only 2 of 4 did and by luck). I tried to add some more breadcumbs and then I included 2 flaxseed eggs and these made it even worse. After some time I decided to try and bake them and it was the best idea. I still couldn’t flip all of them without crumbling some but at least half of them remained intact. Today I made them again and I don’t know what happened but I used the exact same recipe (baked them again) and only 3-4 of 11 came close to intact. Both times I used a sauce made of mayonnaise and ketchup (as instructed) because I can’t seem to find a vegan BBQ sauce in any markets. Did you throughly dry & drain your beans, that could be one of the reasons they fall apart? My beans were almost a dry paste when mashing them which I think made them hold together well. I also used a little vegan wosterchire sauce and less sugar than the recipe. I probably went overboard on the smoked paprika but they were still very good! They held together perfectly. What about the risk of reheating the rice? Delicious, they stayed together well, the recipe made six large burgers. White rice should work Hannah! Enjoy! I made these for the vegetarians at my Labor Day bar-b-que, and they came out great. I used regular walnuts and toasted them a little in the skillet. The burgers held together well on the grill. The method of pressing them into the measuring cup to form the burger worked so well that I also used it for the non-veggie burgers that I made. I used 1/3 cup and the size seemed perfect (for regular bugers 1/2 cup would have been better since regular burgers shrink a bit). It would have made 7 burgers, but I made 6 instead and stuffed some mushroom caps with the remainder. I didn’t get to try the stuffed mushrooms as they were gone by the time I got to the table with the rest of the meal. There were lots of complements, and even the burger that I burned (that I didn’t want to serve) got eaten. Terrible. It’s a good veggie crumble. It’s not a burger. Worked perfectly for me, although I replaced the nuts with oats. I’d suggest perhaps you did something wrong? Just made these almost exactly as written. I substituted toasted hazelnuts because I didn’t have walnuts on hand. I have tried many different veggie burgers but always cook them on the stovetop because they just don’t hold up to the grill. These were perfect on the grill! I served them with red onions and fresh guacamole on wheat buns. Will definitely make them again. My husband cannot eat onions, shallots, etc. due to an allergy. If I leave them out will it affect the moisture of the burger? Meaning, will it crumble? Perhaps I could sub a finely grated veggie like carrots or zucchini? I know onions add some great flavor, but it’s one of those challenges I cook around. Thank you for your amazing recipes, they’ve been a real blessing to our family. Made this recipe a few weeks ago. My meat loving, newly turned vegetarian husband loved this recipe. He said it’s a keeper! Started to pull out the ingredients to make today and forgot I don’t have any more walnuts. Can I sub pecans for walnuts? This burger was delicious! I did not have bread crumbs on hand so I used coarsely ground (in a food processor) rolled oats. It came out perfectly. Thank you for such an easy veggie burger recipe that is so tasty and healthy. I substituted the raw walnuts with pumpkin seeds which gave the burger a distinct nutty flavor and an additional health benefit. I love your recipes, Dana. You are so creative and I love your ingredient combinations that have made eating vegan meals enjoyable. I’m making this for the second time tonight for dinner. Excited as I will be cooking them on the bbq this time! They have a great texture and very tasty! I made these last night. While the flavor was spot on, I was disappointed with the texture and the end result. I think it might be my fault because I did not toast the walnuts- I blended them instead and ended up with an almost nut butter consistency before I added the spices. I figured I could save some time by not toasting the walnuts. Big mistake! I cooked them in a frying pan with just a drizzle of oil. While super tasty, they were a bit mushy. So, if anyone else tries these, don’t be like me. Follow ALL of the directions instead and these will probably be perfect. 1 cup of whole walnuts will be a different yield than 1 cup of whole walnuts that have been milled down. In fact, it will be about 3/4 cup. So if you are substituting an already milled product such as bread crumbs, 1 cup may dry out the mixture too much. Also it will significantly alter the taste. 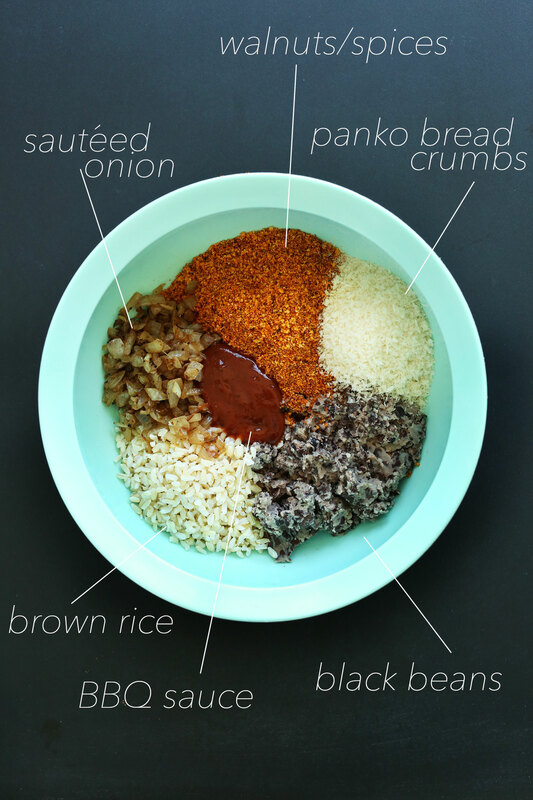 I would suggest a combination of ground nut, crumbs, meal etc., divided as you wish to equal 3/4 cup. Overall Yummy!! Very good recipe. I made it tonight for my vegetarian friend. I made a mistake though – I forgot to add the sautéed onions when I was mixing it up and I didn’t realize until I had formed all the patties. Rather than re-mix all the patties with the onions, I ended up serving the onions on top. Everything else I did exactly as written – I used walnuts because I wanted all the health benefits and flavor they would provide. For the 1/3 cup of panko at the end of the recipe I used oats as suggested. I even made the rice as recommended by the linked Saveur magazine article. My husband, my vegetarian friend and I all loved this bean burger. It was a little crumbly once cooked but not so much that it was a problem. I thought the flavor was amazing and while the spices seemed like a lot, they were perfect. The only potential negative was the consistency which was a little mushy soft, but like someone said before in their comment, these are bean burgers and they tend to be on the soft side. Next time I’m not going to process the nuts so fine and I think I’ll leave the oats whole too (I ran them in the food processor to make them more like breadcrumb consistency). Finally, I didn’t grill them, I fried them in a non-stick pan in olive oil and I made the recommended mayo, ketchup, sriracha for a topping. I’ll be making these again. This is a great recipe. Thank you!! Hello – it says cooked black beans. If using canned black beans should these be heated first then rinsed and dried off? Sorry if this is a silly question. Nope! Just drained and rinsed. They’re already cooked and ready to go. This is one of the best burger recipes ever! So flavourful and they held together amazing! I didn’t have vegan BBQ sauce so I subbed in a tablespoon of soy sauce and 3 of ketchup and it was great! Thank you! I have made these a couple of times now for my vegetarian self and my non-vegetarian husband, who also doesn’t like mushrooms or cheese, ruling out a lot of VB recipes. We both think these are delicious exactly as written. They will hold up with delicate treatment, but I freeze the patties and pan-fry them straight from the freezer — they cook through just fine, and no need for kid gloves. We’re very glad to have this recipe in our repertoire! Can i freeze those beauties? I am neither vegetarian or vegan but my daughter is, so I gave this a try. This was my first attempt at a veggie burger. Whilst preparing the various ingredients, I really could not see how it was all going to come together but once you make that first patty it kinda “looks” right. My only concession was to replace the bbq sauce with a sweet Thai relish (only because I don’t have bbq sauce), but this seems more for binding than for flavour (please let me know if this is wrong). Also I couldn’t find panko, so used normal breadcrumbs! The taste of the burgers was really good except a bit too hot (spicy), I possibly interpreted chilli for something else (maybe cayenne pepper) so definitely overdid the heat factor. Also I made six patties but found them a bit too big for “normal” sized burger buns, next time I’ll make it into 10 burgers. Thanks for the staring point, I’ve got all summer to perfect my veggie burger but at least I’ve made the first step. Very yummy and held together well in a shallow pan on stovetop. However, you’ll want to cut spices by at least 50-75 percent for it to be served to children. All three of my kids, who are 3, 4, and 7, and who eat a lot of store bought veggie burgers (Praeger’s) were running for the fountain after the 1st bite. Otherwise, a good recipe. LOVED this recipe! I added a little garlic to set it off- just fantastic! Thanks for the “ultimate Veggie Burger”!! !